Postscript: I drew this fictional comic for teh lols, not as a cry for sympathy or anything – though if you’d like to persuade all your friends to read and/or buy my comic, please go ahead. Regular readership of the comic is pretty difficult to estimate, though I think it’s about 2.5K, the majority via RSS. I’ve been a fan for a while now, though I have been reading solely on RSS. Being the author of a seldom visited blog myself, I understand the frustrations. I have you whitelisted in Adblock, and will be clicking on the feeds for each comic. Just know that there are people who love what you do. Aw thanks. There’s no ads up here for Adblock anyway, but now that I know I can make a cent or two…. Um. Luke, who the HELL are these other two people??? I thought they were you under assumed names! I’m now as shocked as you are! I clicked through from google reader just for you! Ha! There ought to be a way to track people who read you in an RSS reader like me and the two gents above. The readership doesn’t abruptly end; it tapers off. 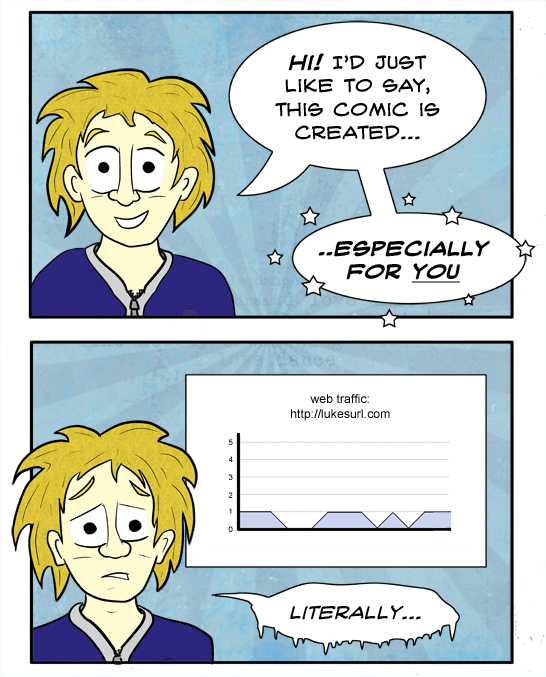 So the sole reader is slowly peeling their gaze away from your webcomic… and you’re somehow registering it. Also clicked through from google reader. 🙂 Really like your comic! Came here for one of the chess comics, have been religiously reading every single comic since. 🙂 This is among my favourite webcomics, love your work. Also clicked through just for you – huge fan! !